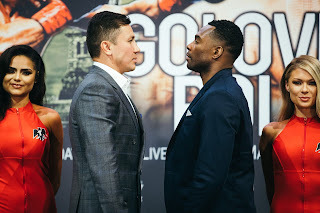 The official weigh-in for Tuesday’s Premier Boxing Champions card headlined by a ten round Welterweight bout between former two-division world champion Devon Alexander and veteran Walter Castillo took place on Monday in St. Petersburg, FL. The official weights for the entire card are as follows. Devon Alexander 146 3/4lbs. vs. Walter Castillo 146 1/4lbs. Conor Coyle 158 1/2lbs. vs. Calvin Metcalf 157 1/2lbs. Roberto Pucheta 119lbs. vs. Shawn Simpson 118 1/2lbs. Anthony Overby 156lbs. vs. Ozodbek Aripov 153 3/4lbs. Jamal Harris 147 1/2lbs. vs. Andre Byrd 146lbs. Marco Antonio Mendoza 119 1/4lbs. vs. Antonio Russell 117 1/4lbs. Miguel Cruz vs. David Grayton 146 3/4lbs. Ariel Vasquez 142 1/4lbs. vs. William Silva 140 1/4lbs. Michael Gaxiola 128lbs. vs. Ricky Tomlinson 126 3/4lbs. Gary Russell 139lbs. vs. Larry Yanez 140 3/4lbs. PBC: Alexander vs. Castillo takes place Tonight (Tuesday, November 21st) at the St. Petersburg Coliseum in St. Petersburg, FL. The card can be seen in the United States on Fox Sports 1 beginning at 7:30PM ET/4:30PM PT and will also be streamed live on Fox Sports Go. Check your local listings for time and channel in your area. Check your listings internationally. For more information about Fox Sports please visit: www.FoxSports.com. For more information on the Premier Boxing Champions series please visit: www.premierboxingchampions.com.